Spring has nearly sprung folks and the time is NOW to get in front of your virtual tour customers with a lovely “GREEN” piece to advertise your photography green up service. 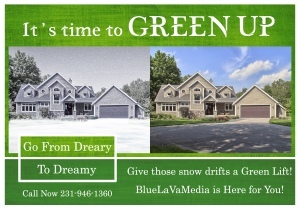 Over at BlueLaVaMedia (Traverse City Virtual Tours) we have inched our green up pricing to $75 per session. Check out our real estate virtual tour pricing on our site! If you’re not selling a green up service you’re missing out. Most RTV virtual tour providers offer this and you should too. It’s a brilliant way to put a KICK into your Spring sales. Every real estate listing that you have shot for your customers since Autumn that’s still active has a high percentage of ordering this service from you! Login to your RPM dashboard TODAY and download this awesome and fully customizable piece. As with most of our virtual tour marketing pieces as of late they are created using Adobe Photoshop giving you the ability to customize them with software you already use, and providing the most professional look in today’s demanding world. 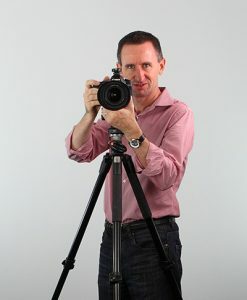 Also RPM fans please keep an eye out for a triple video bonus series starring none other than Darryl Stringer a professional photographer from AU. Darryl’s video will be available to all RPM subscription based users in a few days!! Have you been looking for a pretty slick marketing idea for your virtual tour and photography business? Are you looking to get your brand in front of hundreds or possibly thousands of potential customers? If you said yes to either of those questions then read on team! 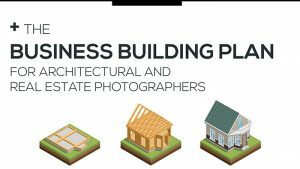 Last Fall the team over at BlueLaVaMedia a Traverse City Real Estate Photography Company and Aerial Drone Service reached out to C-21 of Michigan and offered to take photos of their next event free of charge. Well, not completely free. In exchange for taking portrait and event photos we asked if we could have a trade show booth setup and possibly get five minutes or so in front of everyone. What we got was far beyond what we expected and I think you can do this too! On the day of the event close to a thousand real estate agents from all over Michigan began to pile into the convention center at the Grand Traverse Resort here in beautiful Traverse City, Michigan. BlueLaVaMedia had setup our trade show booth right next to our portrait backdrop area. 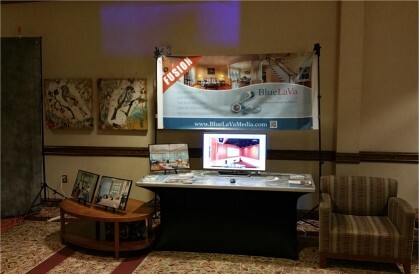 We were able to show off many of our most popular services like our True-Blue photos, our new responsive the virtual tour player, our slick real estate photography app, the amazing drone photos and videos, our popular agent green screen video services, our single property websites, our virtual staging services, Fusion’s printable flyers and we even got a chance to give realtors a look at our up and coming 3D Goggle virtual tour. The exposure we gained from the show was beyond our greatest expectations. Jim Blue and Melissa took hundreds of photos of the event as well as many group photos. The photos they took were later uploaded to a drop site for C-21 to snag and distribute accordingly. No editing on our end by the way! If you’re looking for a great marketing opportunity I would highly recommend to anyone that you try this out. Simply reach out to your local branch office and find out who you should speak with at corporate with regards to donating some of your time to a similar event in your area. Good luck out there and we look forward to hearing about your similar success stories!